Boggioli is situated at an altitude of 460 metres above sea level, at the end of a dirt road that winds through chestnut woods and olive groves. I bought the farm in 1975 and have gradually increased the size up to the current area of ​​about 42 hectares (c.100 acres). 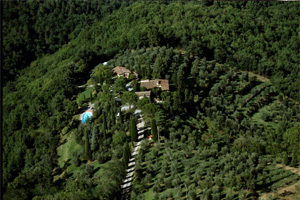 A little less than 3 hectares of land are planted with olive trees. One of the first major projects was carried out in the late 70′s, which was the reclamation of fields and terraces to push back the encroaching borders of the surrounding forest. Another big decision made at the outset was to eliminate the small vineyard to focus entirely on the olives, because the soil and altitude were not, in fact, well suited to grape production.